Please submit your consent forms by Friday. Do NOT leave any cash inside my cupboard. You can pay Mrs Pwee next term but please submit the consent forms by 11 March 2016. Please note also that there's no CCA this Friday as it's the upper primary Sports Day. 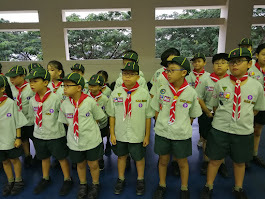 P5 & 6 cubs who wish to meet Mrs Pwee for consultation on working towards the Akela, please email Mrs Pwee (lau_hwai_bing@nyps.edu.sg) to make an appointment.